(by Eve Schaub) and sort of reluctantly started reading it. See, I don’t eat TONS of sugar, but I do have some every day, and I feel kind of attached to it. I don’t want to eat Cocoa Puffs and Pop Tarts for breakfast or anything and I am perfectly happy drinking water instead of soda or juice. But what would life be without a little sugar in my morning tea?? Or without dark chocolate?? 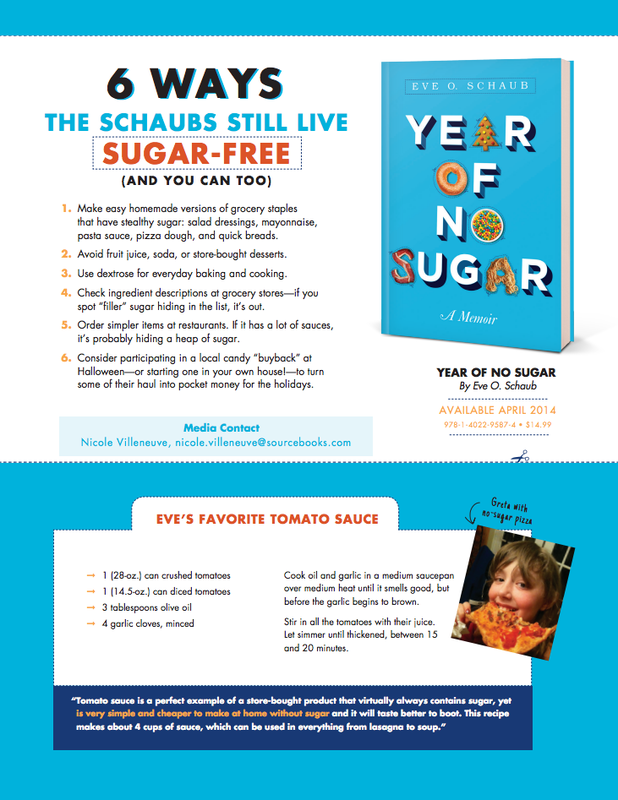 The book chronicles the Schaub’s (a mom, a dad, and two school-aged girls) efforts to live an entire year without eating sugar, which means they had no fruit juice, no honey, no maple syrup, no artificial sweeteners, and of course, no white sugar or brown sugar or molasses. Though they gave up sugar entirely for a year, and though they continue to live a very, very low-sugar lifestyle now (Here are six ways they still live sugar-free), the book wasn’t judgy or preachy, and after reading it, I felt inspired to keep trying to lower the amount of sugar we consume at our house. For those of us who can’t imagine going a whole year without sugar, Eve has put forth a Day of No Sugar challenge, which is in just two days, on April 9th. 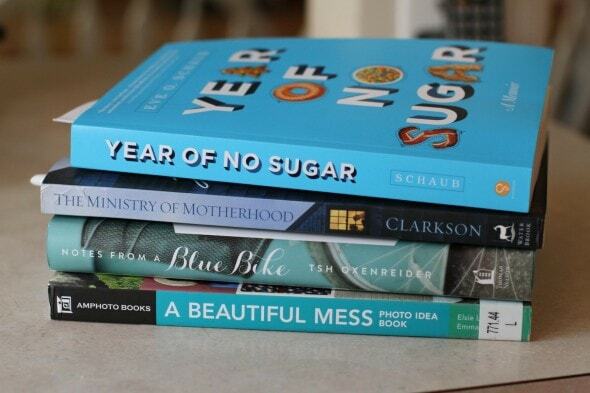 If you sign up for the challenge, you’ll be entered to win one of 10 Year of No Sugar books. I’m actually still working my way through this one, which I snagged for just a few dollars on half.com. I appreciate so much that this book is written by a seasoned mom. It seems like there is a lot of mothering advice available from young moms, especially in the age of the internet, and while I think some of that is helpful and good, I am far more desperate to hear from someone who has been mothering for decades longer than I have. Sally’s kids are all graduated (her youngest is in college, I believe), so she’s been at this for much longer than I have, and I’m delighted to be able to learn from what she’s learned. This is an easy read from Tsh Oxenreider, whom you probably know from her blog, The Art of Simple. Notes from a Blue Bike chronicles her family’s journey from expat living to U.S. living, and is basically about her efforts to make choices that help her live intentionally and in a way that accurately reflects her passions and priorities. I did enjoy this book, but to be terribly honest, one thing that was a bit of a downer for me is that one of the ways Tsh simplified her life was by giving up homeschooling. Which is of course completely fine for her to do, but reading about it was a little bit discouraging for me, especially at this burn-out-y time in the school year. This is good for me to remember…yes, maybe I could be super professional at this blogging gig if I had the time, but the fact of the matter is that I am homeschooling four people right now and so I’m just not going to be able to do All of The Things that really good bloggers should do. Anyway, as long as you aren’t currently experiencing homeschooling/blogging angst , I think you’ll really enjoy this book. I put A Beautiful Mess on hold at the library after reading about it on a blog (I think!) and I was super excited. I thought it would be all about capturing every day life through a camera lens (which I really love doing). However, the book involved a lot more contrived and formal photography situations than I expected so I was a little bit disappointed. Some of it was casual, but there was a lot about doing self-portraits and making photo backdrops and arranging things for shots, and less about shooting life as it happens. Anyway. If you want a book with some good basic photography tips and self-portrait photo ideas, I think you’d like this book. You just have to not be expecting tips on photographing real, messy life. I’d also love to hear your thoughts on any of the books I’m reading! « Right now, I am…. Kristen–Remember that your homeschooling, priorities and amazing scheduling are a large part of what makes your blogging so appealing to many of us readers. I am one of the old-time mothers with decades of practice that you spoke of, and I still learn from a kid like you! Thank you for my daily wake-up reading. Yep. We love you and your blog enriches our lives, but you are a mommy before you are a blogger. One of the things I love most about you is that you are sincere and practice what you teach. I appreciate the encouragement. And you are right…I would have more time to blog if I gave up a bunch of the things that use my time, but then what would I blog about? It would change a lot, and probably not for the better. Amen to what Gail and Ann said! I’m totally with you about dark chocolate. Additionally, I know that saying “never” about a food makes me want to eat a ton of it, right now. Whereas if I say “less” I know I can have some later, which gives me the reassurance I need to have to have eat it now. FYI, other people are the other way around. “Less” doesn’t work for them – they eat just as much as before – but “not for a year” makes it possible for them to stop. On a related note: Quick Apple Dumplings is one of my favorite desserts, which is very low sugar despite it’s dessert status. It’s adapted from Cook’s Illustrated’s Family Cookbook, which specializes in shortcuts and fast recipes. It’s very scalable. The crust is the shortcut bit: Buy a tube of biscuits, roll each one out into a large, thin round. (I haven’t tried this yet with homemade biscuits.) Use it to line a muffin tin (regular or extra large; minitins won’t work here). Then peel, core, and slice 1 apple for every 2 dessert-eaters. (It tastes even better if you use a mix of apple varieties.) Toss with maybe 1-2T. brown sugar, some cinnamon or apple pie spices, and a pinch of salt. Fill each tin with the apple mixture and 1-3 t. butter; if you can, pull the biscuit over the apple slices and pinch shut. Bake at whatever temp the biscuits call for, till the exposed dough is cooked and the apples soft – maybe 15 min. If you weren’t able to pull the biscuit over the apples, you may need to spray them with water (or baste with more butter) so they don’t dry out. These are really good and people think they’re eating a sweet. Yep-I’m a person who can handle moderation, and I bristle at the idea of going completely without. But like you said, there’s a definite sector of the population who operates best with an all or nothing proposition. Thought you would be encouraged to know that Tish returned to homeschooling this year. Oh! Clearly I live under a rock or something. Ha. 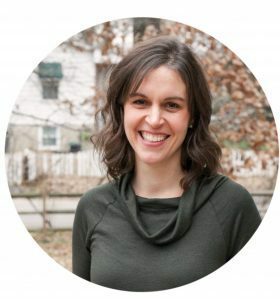 Around the same time I read Tsh’s book, several other kind of high-profile bloggers stopped homeschooling, and so I think the net effect of that sort of got to me, and made me briefly question what I’m doing. I wish people wouldn’t act like sugar is possible to give up. Everything has some sugar in it. I think they mean without added sugar. But even then, that is impossible. Almost every bread out there has a tiny bit of added sugar to help the yeast do it’s job. Yes, you can do much less sugar than many bread recipes want which I do, but then use splenda for the rest. But I have not tried to do sugar free bread unless the recipe calls for that. Some do, I think. Yeah, as I thought, my naan recipe does not use any sugar. I do understand wanting to reduce sugars, but no sugar, means no fruit, no almost anything at all, if we include all natural sugars. Well, they did actually manage to go without added sugar…like they made their own mayo, made their own bread, gave up ketchup and so on. They definitely did eat fruit, though. Just chiming in on the “What have you been reading lately?” part. I read one of those Internet lists — something like so-and-so thinks you’ve only read six of these 100 literary selections. I’d read 42 of ’em and felt pretty hoity-toity. But a friend challenged me — she’d read “A Handmaid’s Tale” if I’d read “Grapes of Wrath.” So that’s what I’m reading. Not sure I’ll enjoy it any more than the previous times I’ve attempted it (if I don’t like something, I stop), but I will finish it this time. Haha-I would totally feel that way if I’d read 42 of them. Now I want to go search for the list! I will echo what Victoria wrote. Tsh is homeschooling again this year. She only gave it up last year when she was writing her book. They take schooling on a year-by-year basis for what is best for their family. If you have time, you should check out her podcast. I really enjoy listening to it. Do you know, I have never listened to a podcast in my life? Maybe I should start. They are fun when you are working out, or doing fairly mindless chores. If I have one saved up, I don’t put off washing the floors, mending, or folding laundry for quite so long. I’ve started really enjoying podcasts, especially when I’m doing mindless activities like folding laundry or getting ready in the morning or I’m in the car. I think I’ve started enjoying them more than music, actually. I typically NEVER buy brand new books. I know that part of the money goes toward the author’s royalties, and the book publisher, and other people who had their hand in getting the book printed. And then profits. Yes. But I found myself with ALOT of extra time on my hands at the airport (flight delayed four hours!). And wouldn’t ya know the only thing I forgot was a book? I’m of the mindset there’s a lot worse things to spend money on. And books? Well…those shouldn’t be something I ever feel guilty about buying. I’d much rather buy a book than,…say… another watch. Or a vase. Or something else I don’t need. I bought “My Boyfriend Barfed In My Handbag,…and Other Things You Wouldn’t Ask Martha,” by Jolie Kerr. ITS SO GOOD. She takes you through a detailed how-to of cleaning. And it’s hilarious. And wonderful. And she doesn’t talk down to you. I’ve learned a few things (some things are “duh”). But it’s a hilarious worthwhile read. Can’t recommend it enough! 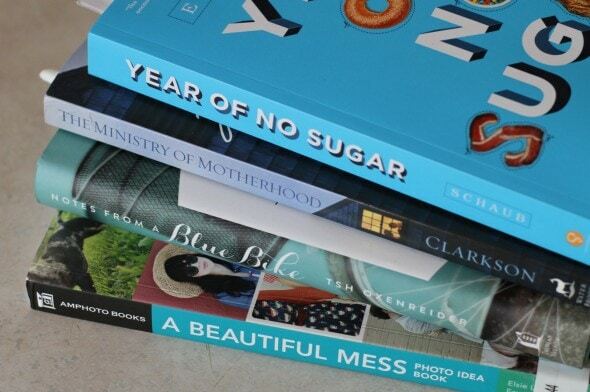 For another perspective I’ve got Don’t Quit Sugar by Cassie Platt on my wish list. From what I’ve read, the anti fructose campaign is based on some flawed studies. I don’t think there is a thing wrong with honey or fruit. I clicked over to the list of ways to avoid sugar and one was to use dextrose for baking. What?!? I don’t get that at all. There’s nothing wrong with using real sugar in a recipe (preferably the least-processed, most fairly traded sugar you can find). The way sugar is used in the modern American diet is truly dangerous but the idea that you can just replace it with something manufactured is far worse. A better goal might be that if someone couldn’t make it at home, don’t buy it to put in your food. Or, if your Granny didn’t have it in her home, don’t eat it (or maybe that should be Great-Granny because my Granny was hooked on margarine – all her recipes call for “Oleo”). Bread doesn’t require sugar but if you want to use a sweetener, stick with honey. And dextrose is sugar. It’s just another form. Oh, and honey is also just another form of sugar. Use the one that has the flavor you like best. My library has a National Geographic Guide on Photography called Photographing Your Family. It might be more the kind of thing you’re looking for–it does have some info on doing portrait sessions with your kids and so on but also covers how to take good pictures of sleeping kids, that kind of thing. Kristen, I LOVE your blog. I get an anticipatory burst of happiness when I see it in my inbox, especially on longer post(s) days. I’ve subscribed & unsubscribed to different blogs. Yours is the real deal, and is just fine on the professionalism to boot. Your sincere fondness for your readers shines thru. – Molly P.S. Now go have a piece of dark chocolate as a treat. Hello Kristen! They seem so interesting books to read. I only learned about Tsh’s book and blog by reading yours and the other blog that I’ve been following. I will buy her book once I’m done with the two books I currently reading. One is Dave Ramsey’s The Total Money Makeover and the other one is Lorilee Craker’s Money Secrets of The Amish. I’ve been interested how Amish people live and finding some tips from them will really help our simple living. Hope someday you will publish your own book too and I’ll grab a copy for sure! Try reading Sally clarkson’s book ‘The Mission of Motherhood’. I read both the ministry & the mission, and found the latter far better!! Oh, that’s good to know! I’ll see if I can find it on half.com. Ditto what all the other ladies are saying about your blogging. I love that you know what is important and have a plan in motion that reflects your heart. I learn things like that from you As far as what I’m reading – We are reading The Wheel on the School by Meindert DeJong. This is the second time we’ve read it, and although it’s going slower than I wanted, we are really enjoying this very special, sweet story. FYI, there are also some GREAT free lapbook resources on the internet in case you were wondering! I am just impressed you have time to read!! Between homeschooling, blogging, and housework, I fall asleep after reading 2 pages! I am trying to start the second Game of Thrones book. The first time I tried it was a massive fail but I was finally on loan on ebook from the library so I figured I better jump at the chance Thanks for all the info on the books! Even if you don’t do All The Things, your blog is still my favorite. Goodness! I’m not sure which is worse, no dark chocolate or no maple syrup!For me, the real deal is definitely a MUST with homemade pancakes! King Arthur “white whole wheat” flour makes lovely ones, with the red & white plaid cookbook recipe. It’s on page 59 in my mom’s cookbook. I’ve no clue which it is in mine, but presumably something similar??? For an easy a.m. breakfast, keep a jar of the dry ingredients handy and just add the rest when you’re ready to make them. My favorite Holocaust book is Night by Elie Wiesel. Very poignant. It is one of my five “stranded on an island” books. I’m also randomly reading through An American Childhood by Annie Dillard. “Randomly” meaning I’m picking it up at random times and gradually reading the pages in order. I like her mix of humor in the everyday. The Seventeen Traditions by Ralph Nader caught my eye recently, so I’m working my way through it, too, in spite of it being thin (once again the “random” effect). I’d probably call it a memoir of sorts. He recounts stories about the connectedness of generations during his childhood. Two others of my 5 island books are: Living a Beautiful Life by Alexandra Stoddard and Blink by Malcolm Gladwell. When I feel like “thinking my tastes are broader”, the last two in my list are up for grabs. Realistically and to those who know me best, predictably, the last two are written by P. G. Wodehouse and Jane Austen. P. D. James – also great vocabulary. Be forewarned that she’s heavy on description. I enjoyed her Austen-themed mystery titled Death Comes to Pemberley. Dorothy Sayers – creator of Lord Peter Wimsey. My favorite is Unpleasantness at the Bellona Club. 2. P. G. Wodehouse – He’s a British humorist – creator of Bertie & Jeeves and also of Blandings Castle. When it comes to understatement, you can’t get funnier than Wodehouse. Also his books are great for reading aloud. It was one of my mom’s staples for bedtime with us kids. I was always the last one awake, asking for “just a bit more”! Thanks for your cheerful, encouraging, daily-life snapshots. I appreciate reading your realistic stories & if my lunch doesn’t happen before 4 p.m. it’s due to my consultation of your smart phone advice/recommendations/dos & don’ts! Thanks for all the recommendations! And I do hope you managed to get yourself some lunch!